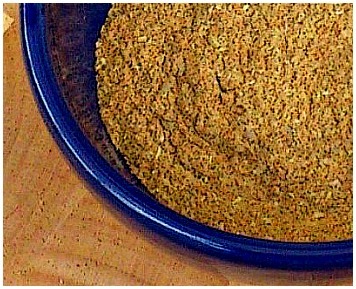 Popcorn Seasoning | Hot Buttery Popcorn With a Curry Twist! There was no popcorn seasoning when I was growing up in the 70's! Not here in the UK anyway. Butter and salt was what we had to make do with. But a quick look in the stores and there is a whole host of tasty-sounding concoctions: Cajun flavour, Italian and BBQ blends to name a few. This is my version of a curry flavoured seasoning. Store your popcorn seasoning in a cool place in an airtight jar out of direct sunlight. Use within 3 months before making a fresh amount. Ingredient Note: For the best flavours, I recommend you use whole coriander and cumin seeds. If you don't have one or the other, you can use pre-ground coriander and cumin powder, just halve the amount you use. So instead of 2 tablespoons coriander seeds you would use 1 tablespoon of pre-ground coriander. Reduce the cumin by half as well if you don't have whole and stir in with the other powders. How to Use: I usually make 2 servings of popcorn at a time and for that I pour about 6 tablespoons of melted butter all over with about 2 tablespoons of the mix stirred in. I then give it all a good shake so it gets evenly coated. If you need to make more servings, just increase the amount of butter and popcorn mix you use. Note: There is a teaspoon or two of salt in the recipe. However, some folks like theirs really salty. If so, you can sprinkle over some more after making.